In my visits to Texas, I've only traversed the panhandle once, and that expedition was but a quick drive that only allowed for a single gas stop prior to Amarillo. I remember the spot well, right off the highway at a gas station without prices. Seeing that I was running on fumes, I didn't care to risk looking for a second option, so I pulled in and counted my cash to make sure I had enough to pay for a little more than usual. The lady did ending up charging me (what I thought was) too much, but since I was in a hurry and in little position to argue, I paid, hopped back in my car and raced on through Amarillo into New Mexico. This whole escapade was nearly a decade ago, and while I haven't been able to stop back to visit, the Texas panhandle has seemingly changed for the better since my last visit. 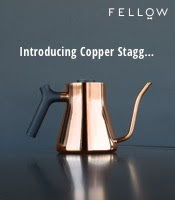 One particular improved facet has been the coffee scene, with places like Palace Coffee Company conquering competitions like America's Best Coffeehouse Championships in Portland 2014. As a fortunate worker in that particular competition, I had the pleasure of not only witnessing Palace's skills, but also in sipping their coffee roaster of choice, Evocation. Located in Amarillo, Evocation Coffee Roasters has a national reputation for making some amazing coffee come to life. Recently I had the tremendous fortune to try out Evocation in my home laboratory thanks to the great folks at My Coffee Pub. The coffee that was expediently sent out was their Kenya Kiruga, a package of beans I sampled via pourover, french press and siphon. The pourover, a juicy-sweet and savory medium-bodied brew, displayed tomato, peach, nougat, nutmeg, lavender, sage and succulent roast turkey. The french press walloped with massive peaches, as well as some nougat, lavender, cream, collard greens and turkey gravy in a medium body. The siphon kept with the potency, slinging berry, light chocolate, fresh italian bread, whipped cream, lemon and walnut. 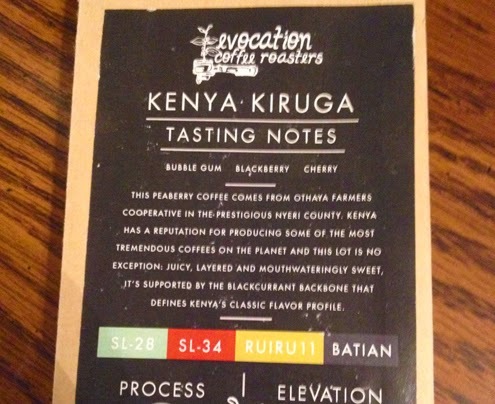 Similar to every Evocation coffee I've slurped prior, this Kenyan was a delicious gem. 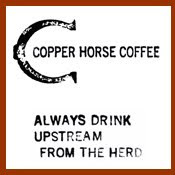 No matter the brew you seek, check out My Coffee Pub to discover great roasters and Evocation Coffee Roasters for some truly amazing Texas panhandle coffee. Note: The coffee was provided free of charge, the above review is objective feedback. Thanks for the love for our burgeoning coffee culture in the flatlands of the Panhandle and for judging at ABCoffeehouse comps. We love Evocation and now you can see (and taste) why. Does Disney World Have Good Coffee?